The XM101 Common Remotely Operated Weapon Station (CROWS) addresses the modernization of existing small arms weapons systems by providing for the engineering and manufacturing development of a remote mounting system for heavy and medium machine guns. The system integrates the MK19 Grenade Machine Gun, M2 Machine Gun, M240B Medium Machine Gun, and the M249 Squad Automatic Weapon (SAW). PM Soldier Weapons has near term plans to begin integration of their advanced Crew Served Weapons family, including the XM307 and XM312. The weapons operate off of a larger ammunition supply than that of the standard crew-served weapons. With larger combat loads, the weapon is reloaded less, keeping the crew inside the vehicle. The CROWS will provide the capability to remotely operate crew served weapons, improve system accuracy and operational response time by integrating state of the art drives, controls and sensors. The CROWS will also provide a baseline for a common armament platform for insertion across a variety of vehicles to reduce life cycle cost. The system will be modular and have an open architecture to permit further improvements. The system will improve aiming accuracy and maximize probability of hit against a wide variety of targets. The funded effort will provide pre-producton prototype systems for the Armored Security Vehicle, Up-Armored HMMWV and Future Combat Systems (FCS) in accordance with the Current to Future transition path of the Army's Transformation Campaign Plan (TCP). CROWS is mounted on High Mobility Multipurpose Wheeled Vehicle (HMMWV) enables gunners to accurately engage targets viewed on a computer screen from the safety of their vehicle. CROWS allows Soldiers to operate successfully from within the safety of the Humvee's armor, without being exposed to the threat of improvised explosive devices and small-arms fire. The improved stable platform will support most crew-served weapons and contains a sensor suite and fire control software that allows on-the-move target acquisition and first-burst target engagement. CROWS can traverse 360 degrees and go 60 degrees up and 20 degrees down. The technology used on the CROWS is a variation of the remote-controlled crew-served weapons system already used on combat vehicles like the Bradley fighting vehicle and the M-1A1 Abrams tank. The nearly $200,000 system is designed to replace the turret gunner on Humvees to improve combat effectiveness. The system incorporates a 15-inch color monitor with live video from cameras in the daytime and thermal imaging cameras in darkness. Both cameras use a laser range finder, which allows the gunner to zoom on targets, lock onto them and maintain that lock accurately while the vehicle is in motion. The camera and the weapon can be used together or separately. The camera allows the gunner to look one way with the weapon pointed another. This feature becomes particularly useful when observing suspicious subjects from a distance, Soldiers said, adding that way people are not scared off by a weapon pointed at them. The gun itself is controlled by a joystick which gives the gunner 100-percent functionality, allowing the operator to control the weapon with just one hand. The weapon can be aimed up to 60 degrees above and 20 degrees below in front of the vehicle and can turn a full 360 degrees, allowing the gunner to see almost any threat no matter where it is located in relation to the vehicle. With all the features used properly, the weapon can be used at 98-percent accuracy while the vehicle is in motion and the enemy on the run. The weapon is smart enough to know the vehicle's movement, the earth's movement and the enemy's movements. In December 2004 Project Manager Soldier Weapons announced execution of an Army's Urgent Material Release for Common Remotely Operated Stations (CROWS) to support Operation Iraqi Freedom (OIF). The system was mounted on top of a HMMWV, enabling a gunner to perform missions from the safety of the inside of the armor-plated vehicle. With the use of a stabilized targeting platform, CROWS provided the Warfighter with an offensive advantage to rapidly identify, assess and engage the enemy at greater distances. The Soldier is able to view targets independent of gun elevation for MK19 super elevation and non-threatening surveillance mode. The sensor suite includes a daytime video camera, second-generation FLIR and laser rangefinder for day and night mission requirement. 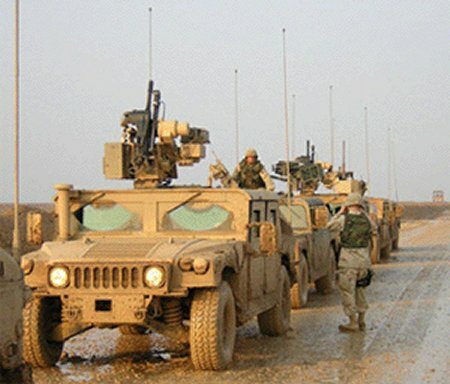 The first group of 35 remotely-operated weapons for mounting on top of Humvees arrived in Iraq in early 2005 and the systems were divided among military police, Special Forces, infantry and transportation units. 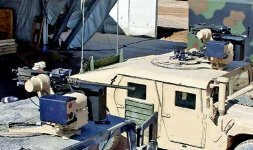 Military Police (MP) in Iraq operated first generation CROWS with "shoot-on-the-move" stabilization, day and night-time sensor suites and fire control capabilities to gain vantage points in challenging terrains. With a "first round on target" feature, the system also limits collateral damage. Soldiers provided valuable operational performance and systems feedback to the project office. In a route reconnaissance mission, MPs using CROWS went out ahead of the convoy to gather intelligence and gain a vantage point. After reconnaissance of the route, they moved to an over watch position. Situated on a hill, the MP team leveraged CROWS' high-powered sensor suites to identify a terrorist preparing to attack the convoy and instantly acquired a ballistic solution to engage him. The product office continues to evaluate operational data from theatre and emerging data from second generation CROWS, now being tested at Aberdeen Proving Grounds (APG) in Maryland. As second generation CROWS completes developmental testing and heads towards Milestone C, The United States Army Military Police School and PM Crew Served Weapons will integrate the Soldiers' operational assessments to drive additional improvements. Field service engineers already deployed to Iraq will continue to work alongside the Soldier to deliver vital theater support when new systems are fielded. By late 2004 CROWS had been tested out on HMMWVs and has completed limited testing on a Fox NBC reconnaissance vehicle. It can be mounted on a range of platforms for military units with different mission profiles. Product Manager for Crew Served Weapons works with customers to define their needs, configure the platform, design the installation kit and integration requirements, conduct tests and ensure supportability. This can all be done rapidly with the user involved in the entire process. CROWS was developed in conjunction with Recon Optical, Inc. (ROI) based in Barrington, II. The Army will be fielding over 300 systems by the end of 2006.